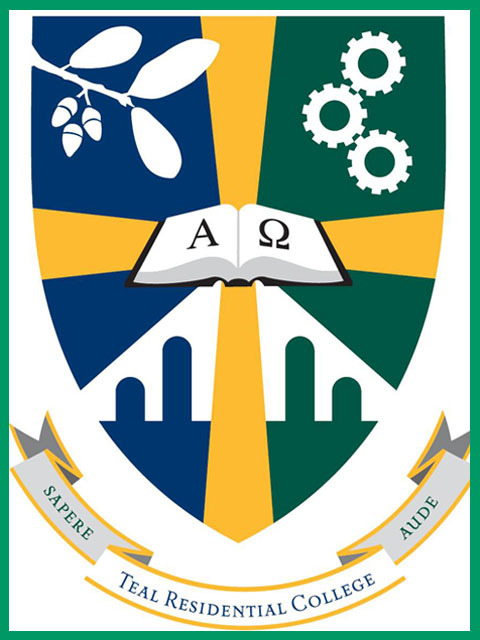 The symbols, words and colors on the crest for Teal Residential College (TRC) were selected from student designs submitted during the spring semester of 2012. At a subsequent public viewing, students and faculty commented on the designs and the graphic elements in each one. Based on these comments, junior electrical engineering student Jessica Siler drafted the final design, which was digitally rendered by the architectural firm for East Village. Prominently featured in the center of the crest is an open book, a thematic element common to the crests of Baylor's residential colleges. Referencing Revelation 22:13, Alpha and Omega signify the mission of TRC to be a "Christ-centered fellowship" from the beginning to the end. The structure near the bottom of the crest is reminiscent of the designs of ancient bridges and aqueducts, representing some of the earliest engineered structures. Its six pillars correspond to the days of the biblical creation account and symbolize the creative aspects of the practices of engineering and computing, the academic disciplines of most TRC residents. The bridge connects Truth (blue) with Hope, Joy and Love (green) through the cross that subdivides the crest. The upper right quadrant shows three gears, signifying the three academic departments within the School of Engineering and Computer Science at the opening of TRC in 2013. Each gear has 11 teeth, marking the date November, 2011, when construction was approved by the Baylor Board of Regents. Together, the 33 teeth represent the span of time from 2013 back to 1980, when the School of Engineering and Computer Science was formed at Baylor University. The oak leaves and acorns in the upper left quadrant signify strength and wisdom, in accordance with the TRC mission to foster the pursuit of wisdom. They illustrate a Live Oak branch, which is the most common type of oak tree in central Texas. Proclaiming sapere aude (dare to know), the banner urges the members of TRC to be men and women of strong faith and sound reason, emulating the community namesake Gordon K. Teal. A Baylor graduate with degrees in mathematics and chemistry, Dr. Teal is widely recognized for his contributions to the development of the monocrystalline silicon P-N junction, which made possible the first commercially viable silicon transistors and opened the floodgates of innovation in electronics and computing. Astute observers will note a stylized schematic of the P-N junction in the crest, honoring the life and work of Dr. Teal.